We woke to a sunny morning at our Hammamet hotel campsite, and I was greeted with pink roses picked from the gardens by the maintenance chap and by one of the cleaning ladies. The deeper we travel into Tunisia the more we are loving its charming people. From Hammamet we originally planned to go south following the coast, but on reading around the separate chapters in our guidebook realised that there were things to see in the eastern part of The Tell region, within 50 miles or so inland that might be difficult to fit in later if we do make our intended rough circular tour of the country. It’s quite sparsely populated in this area though and there are no campsites, virtually no hotels in spite of being near major sites, and so maybe we’d be wild camping again? The first part of the day saw us head towards Zaghouan, a small old town that nestles on a ridge below one of Tunisia’s biggest and most dramatic mountains Jebel Zaghouan, part of the Dorsale range – an extension of the Atlas mountains that stretches across North Africa from Morocco. It was brooding under a cloud as the weather had become rather less inspiring by the time we reached the area. Before visiting the town, we took a detour to try to see a Berber hill village mentioned in the guidebook. No joy though. 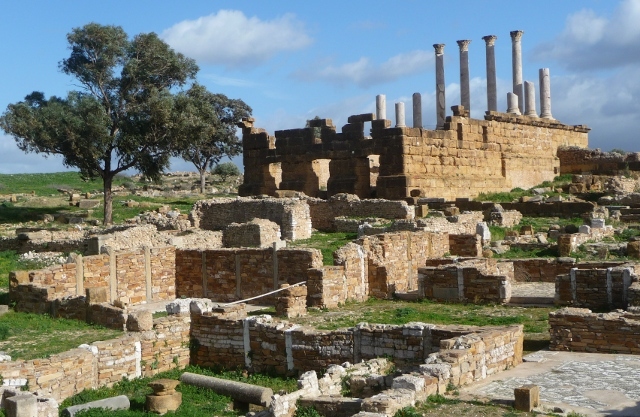 The village of Zriba, is apparently abandoned, but there are two other towns named Zriba nearby – Zriba Hammam – a tourist spa resort mainly frequented by Tunisians, and Zriba Village, a newer rather desolate place. You supposedly took a rough track out of Hammam Zriba to get to the picturesque abandoned Zriba. We arrived to a tat filled tourist street blocked off to traffic and were immediately touted for parking fees. There didn’t seem a way through or round this so this foray was aborted, and we headed back towards Zaghouan. We stopped to fill up and as we were about to drive away, a chap called out that we were leaking petrol. 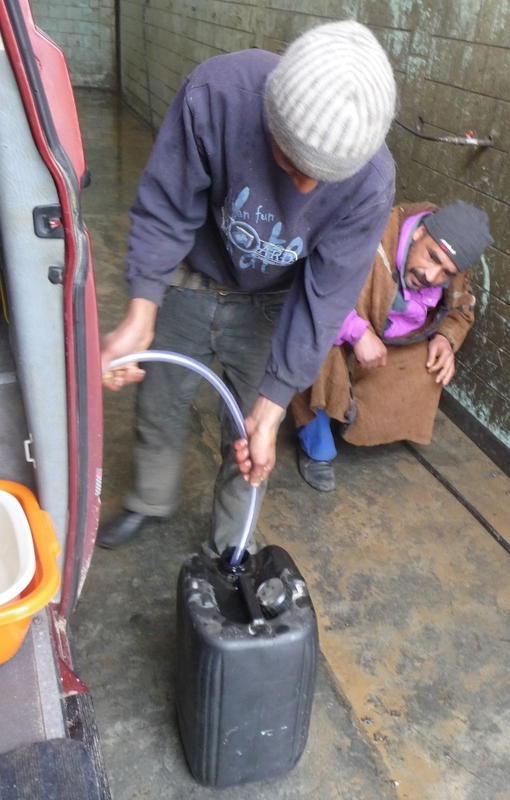 The garage hands moved us into a car washing shed to empty the excess from the tank. We’ve always had a slight drip from near the tank filler when we fill to the brim, but this was much more dramatic and from a different place – it looks like something else to add to the list for the next round of jobs on the van. Above Zaghouan, and not quite in the clouds, were the Roman ruins of the temple of the waters. This once palatial structure was built around the spring of water that flowed down through the aqueduct that supplied water to Carthage, 130km away. There are remains of the aqueduct to be seen apparently, south of Tunis, but we’d not been aware of them as they were off our route to Nabeul. There were stunning views from the hill, but the mountain itself was still hiding. We had a wander around town although we failed to find the Roman archway that is supposedly here in spite of driving around several times and asking directions! From Zaghouan we headed towards the Roman site of Thuburbo Majus. 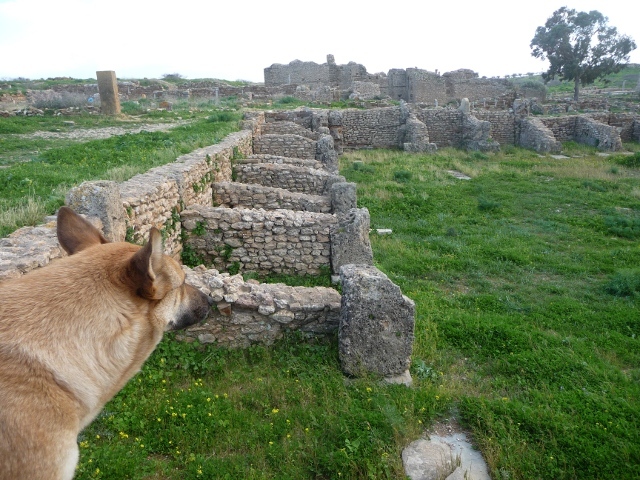 It is a substantial site and, like Kerkouane yesterday, we had it entirely to ourselves. Except for our guide that is, a sandy dog who left her place sleeping in the sun to patiently accompany us around making sure we didn’t come to harm. Oh and the couple of old men who tried to sell us Punic and Roman coins they’d found at the site after recent rain. 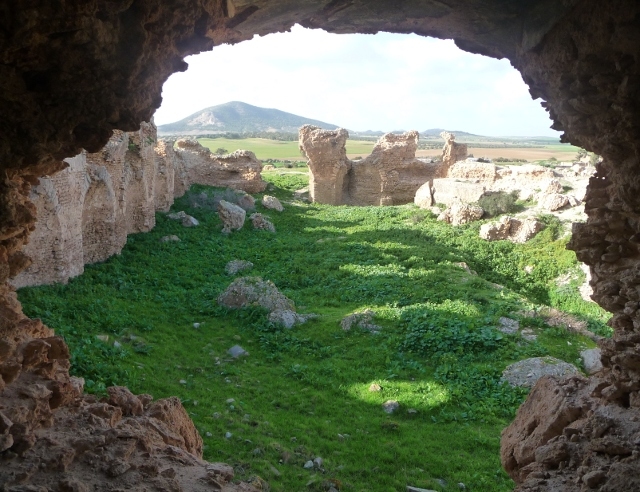 Thuburbo Majus was a Berber Carthaginian site before the Romans arrived, and was abandoned after the 7th century Arab invasion. 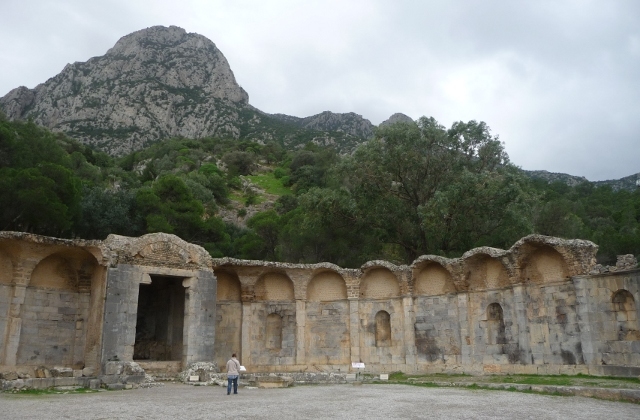 The ruins date mainly from the 2nd and 3rd centuries AD. We were awed at first sight by the honey coloured stones. There are significant remains of temples and market stalls, summer and winter baths, as well as houses spread across the hillside. We walked through the remains of galleries above a deep cistern and then down to the formerly luxuriant winter baths with some of the mosaics still present. We spent a good hour and a half walking around and were reluctant to leave. The real guardian was really friendly and we feel he would have let us wild camp outside or help us find a spot. It was still a bit too early in the day to settle though so we said our goodbyes and our dog went back to her place in the sun. 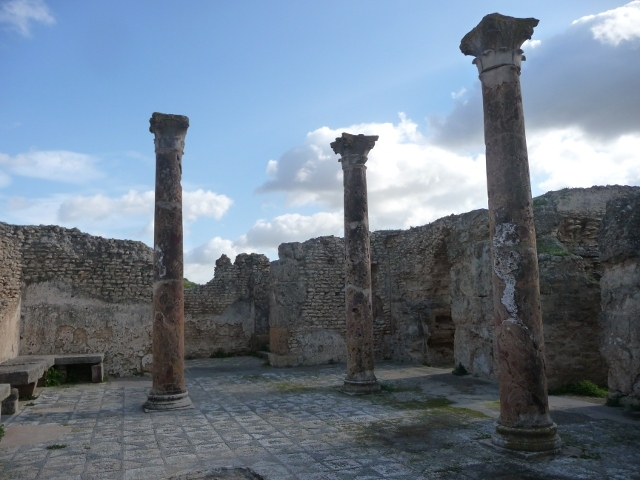 We decided to head south for the holy city of Kairouan and look out for camping spots on the way. The road was straight and there wasn’t much between El Fahs, the town just south of the Roman site, and Kairouan. The scenery was dramatic at first, Jebel Zaghouan now had the sun hitting some of its rocky base, but was still reluctant to shed its veil of cloud. The hillsides were bright green with a thin layer of lush grass belying the red sandy soil beneath and other mountains whispered in the distance. Berber shepherds tending their flocks the same way they’ve done for centuries appeared every couple of kilometres, and roadside sellers of produce piled high marked the way. Men standing at the edge of the road holding what looked like sticks enticed us with their wares. We realised after a while that these were not celery or rhubarb, but large spring onion-like bunches. Lots of waves and greetings on the way as we drove out of the hills and into the plain, a prelude to the desert. It was so very flat and really didn’t provide a lot of scope for rough camping. There are often police checkpoints along the roads that seem to focus on trade vehicles, but at one point a young soldier flagged us down. The very shy freshfaced young man just wanted a lift to Kairouan and we were happy to oblige. We reached the chaotic outskirts of town at evening rush hour and wended our way to what we hoped was the centre, there not being any signs at all. We managed to find a landmark, the central Post Office by a roundabout, and were able to pin point vaguely where we needed to be from here. In the meantime, a chap on a moped insisted on showing us where our proposed hotel was, offering his guiding services for the next day and the chance to buy carpets as well – both of which we turned down. We checked out a couple of hotels and settled on Hotel Tunisia which had a spacious room overlooking the side street where we’d parked the van. Safely ensconced, we set out to find somewhere to eat. This entry was posted in Art & Culture stuff, By Country - Tunisia, Travel stuff, Van stuff. Bookmark the permalink.